Classic Canopies formal tents can be used for all occasions. 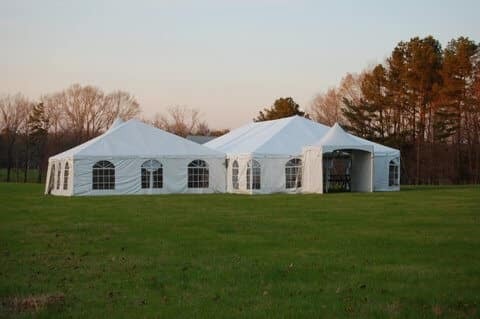 Whether you are hosting a formal wedding reception or an intimate event at your home, Classic Canopies can meet your needs. You’ll find that a do-it-yourself home wedding or intimate event can be a stress free special occasion with Classic Canopies help. The day before the wedding, we will put up the tent and arrange the tables and chairs. Supervise the placement of these items and then you are ready to decorate. Keep it simple with greenery and ribbon. Invite members of the wedding party to share in the fun of setting the stage for the big event. Plan on three large tables for food service: one for the buffet, one for beverages, and one for the cake. Use a variety of serving dishes to create a warm, casual atmosphere. After most of the guests have left, organize a cleanup party, with a little help from your closest friends. We will come pick up everything the next work day. Classic Canopies reserves Sundays for worship and family time. With a little bit of planning you could throw a spectacular wedding, reception, rehearsal dinner, anniversary, birthday party, barbecue, or reunion at your own home! Give us a call to help you start planning your special event today!